London (AFP) - Roaring Lion produced a standout performance to give trainer John Gosden his first win in the Juddmonte International Stakes in a classic edition of the all-aged Group One at York's Ebor meeting on Wednesday. Oisin Murphy set sail for home early in the straight on Roaring Lion (3/1) and he was never in danger of being denied as 8/5 favourite Poet's Word had been caught in the middle of the pack. His owner Qatar's Sheikh Fahad Al-Thani lapped up the moment as he had missed his previous Group One win in the Eclipse Stakes because he had been stuck in the Eurostar terminal in Paris with his train for London delayed. "This is so special," he said. "We always knew he was a terrific horse. He is improving race by race." Murphy, who the Sheikh said had been so relaxed he had slept on the helicopter to the racecourse while he was a bag of nerves, said the race for which the winner pocketed just over £600,000 ($775,000) had gone like a dream. "See how good he is...he is an outstanding horse," said Murphy. For Gosden it was reward for having to handle a "tricky" customer earlier in the three-year-old's career. "He ran a lovely race," said Gosden. "I expected a big performance and he delivered one." The five-year-old Poet's Word -- whom Gosden had been under-bidder on at the sales four years ago -- took second whilst the 50/1 roughie Thundering Blue more than repaid his connections who shelled out £75,000 to supplement him as he took third and £114,000. "He thinks he is the boss," grinned his trainer David Menuisier. "It is a good thing we never look at the odds and nor does he. "He is going to get plenty of his favourite Polo Mints this evening." Earlier Old Persian put behind him a disappointing run in the Irish Derby producing a brave performance in winning the Great Voltigeur Stakes holding off fellow Godolphin Operation runner the 6/4 favourite Cross Counter. Whilst Old Persian's odds for the oldest classic next month's St Leger were slashed from 20/1 to as short as 6/1 he failed to dislodge Kew Gardens as favourite despite the Aidan O'Brien-trained runner finishing third. "I was very impressed with him," said Old Persian's jockey James Doyle. "All he does is gallop. The St Leger distance will suit him." Cross Counter will miss the race to tackle the Melbourne Cup. 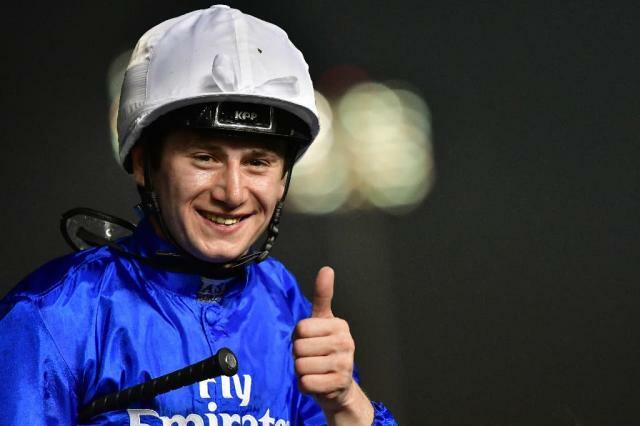 "The Melbourne Cup has always been the plan for Cross Counter and hopefully this will put an extra half-kilo on his back and get him into the race," said Appleby. "I didn't want to take him to Australia and run in a prep-race -- not as a three-year-old. I want to run him off the plane." Phoenix of Spain -- ridden by the in-form Jamie Spencer -- earned quotes of around 25/1 for next year's English 2000 Guineas winning the Group Two Acomb Stakes. The winner's trainer Charlie Hills said Spencer -- who had won five races at Yarmouth on Tuesday -- said he had settled well after giving him cause for concern at how edgy he was going to the start. "They went a good gallop and he came home well," said Hills. "He hit the line hard and you'd think he'll get a mile."